Published on Monday, December 19, 2016. This article appears in the December/January 2017 issue of American Craft Magazine. Rik Allen, in the spacesuit he designed for the 2016 Glass Art Society conference fashion show, ready to board one of his sculptures. 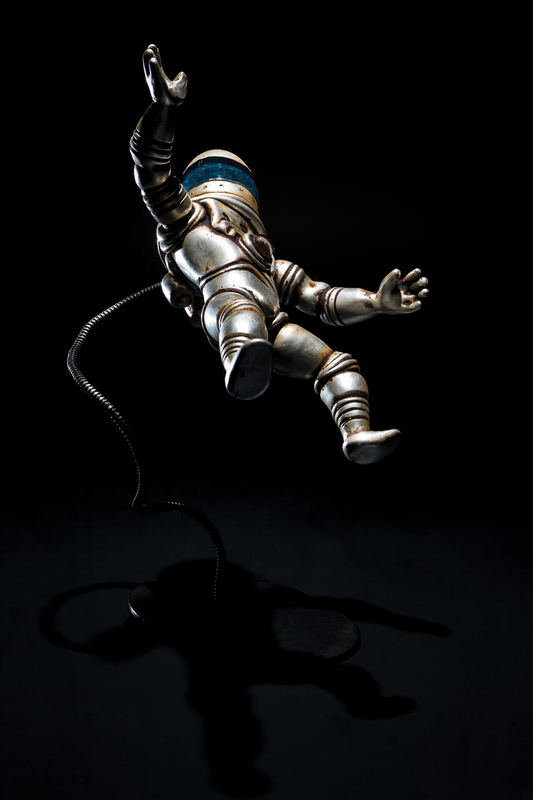 The suit has a blown-glass helmet, with belt-mounted air supply. Space. It’s the final frontier, as any Trekkie can tell you – whether that means the outer reaches beyond the stars or the inner realms of your own mind. 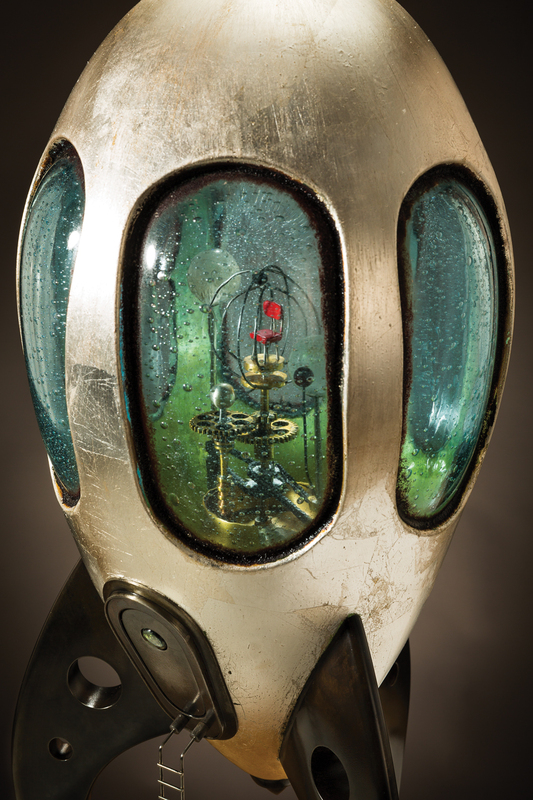 Rik Allen’s blown-glass and metal art evokes exploration of both kinds. Rocket ships, cosmonauts, and space helmets sport the cheery, chunky gleam of midcentury sci-fi imagery, but with the slightly battered patina of experience. Where might these ships already have traveled? Where could they go next? Inside some of the ships are tiny telescopes and lone red chairs. For whom – past pilots or ones yet to come? Allen’s fascination with imaginative journeys is evident even in his earliest artwork. Growing up in Providence, Rhode Island, he was a “distracted kid who drew on everything.” He populated his junior high and high school notebooks with doodled scenes from Star Wars and fantastic creatures, and admired the cool-looking aircraft diagrams his father, an inspector for the Air Force, brought home from work. But Allen, 49, saw his future in science, not art. It wasn’t until he was studying anthropology in college, and taking a few ceramics and drawing classes on the side, that his course shifted. After graduation, he returned to Providence and worked as a studio assistant for several ceramic, glass, and mixed-media artists. “I really lucked out and got to work with pretty fantastic people,” he says. Allen deftly applies that experimental approach to his own projects. 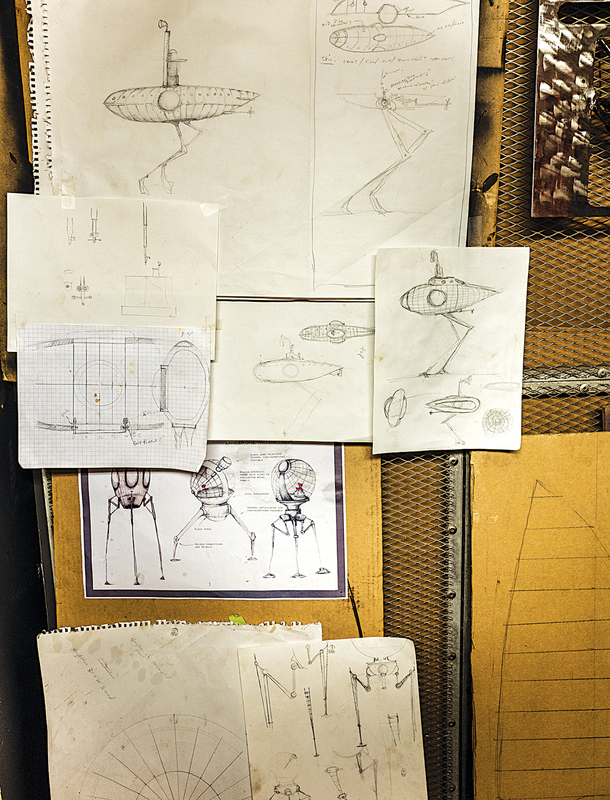 He begins work on each of his futuristic artifacts with elaborate sketches that evolve with the project – the sophisticated successors of those early notebook doodles. 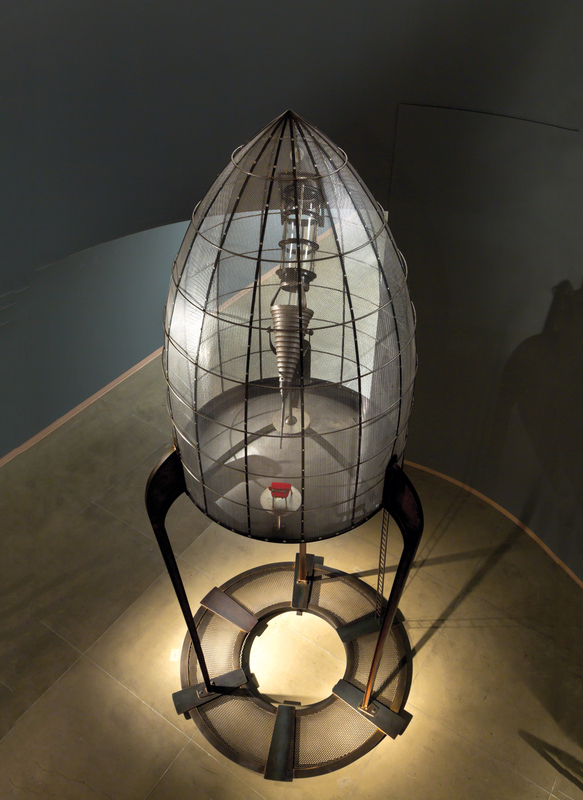 For a typical spaceship, once the main form is blown in glass, he might let it cool and engrave details onto it. He might cut out windows, reheat the form, and blow a second one inside it, letting the new windows bulge outward, often covering the outer form in foil while it’s hot to create a fusedon metallic skin. Then it’s on to the metal shop, part of the 5-acre home and studio complex in northwestern Washington he shares with his wife; then Allen and 20-year collaborator Jeremy Bosworth – “friend, colleague, and right-hand man” – brainstorm how to make and fit ladders and legs and the tiny telescopes and chairs. The chair itself is modeled after the stackable red chairs Allen remembers from his school days, “that time when we’re absolutely the most curious and the most blown away” by every new discovery. He’s retained that sense of curiosity – which, on at least one occasion, brought him into contact with a world far, far away from his own: As a visiting artist at the Chrysler Museum of Art in Norfolk, Virginia, this past spring, he was offered the chance to visit NASA. There, he hung out with scientists, including some who are developing vehicles for missions to Mars and its moons. One of their ship designs especially caught Allen’s fancy. He decided to re-create it and invited the NASA scientists to come to the museum and watch him work. “I realized how similar artists and scientists are in a lot of ways. They’re all creative people,” Allen says. “The conversations that happen are very easy. You feel you’re on the same wavelength.” Allen is optimistic that scientific exploration – terrestrial and beyond – can help humans learn to live in better balance with the planet. Barbara Haugen is American Craft’s shows editor. 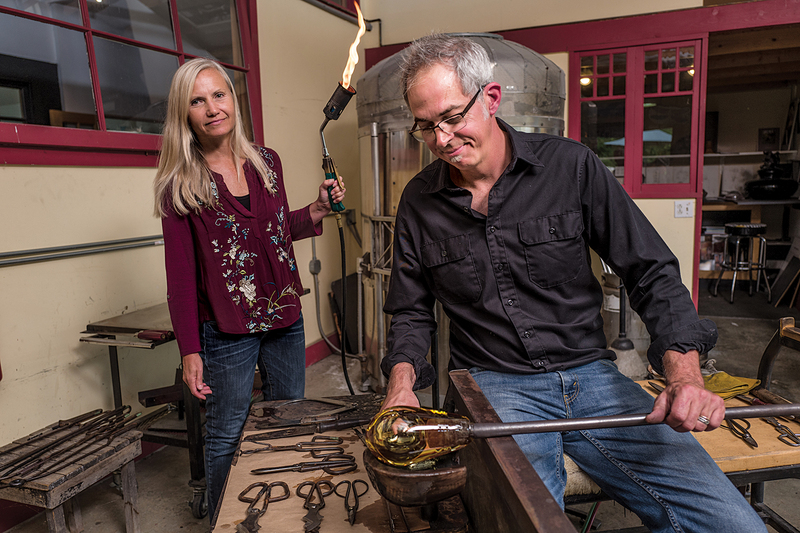 Glass artist Shelley Muzylowski met Rik Allen at Pilchuck Glass School. The couple, who married in 1998, share a hot shop on their property in Skagit County, Washington. Sketches for various sculptures, including the recent Salish Sojourner. The concept went through several incarnations before its completed form was unveiled this fall. The 15-foot Seeker (2013) features one of Allen’s signature details: an empty red chair, modeled after those he remembers from his school days. The seat invites viewers to place themselves in the work and harks back to childhood years, “that time when we’re absolutely the most curious,” he says. 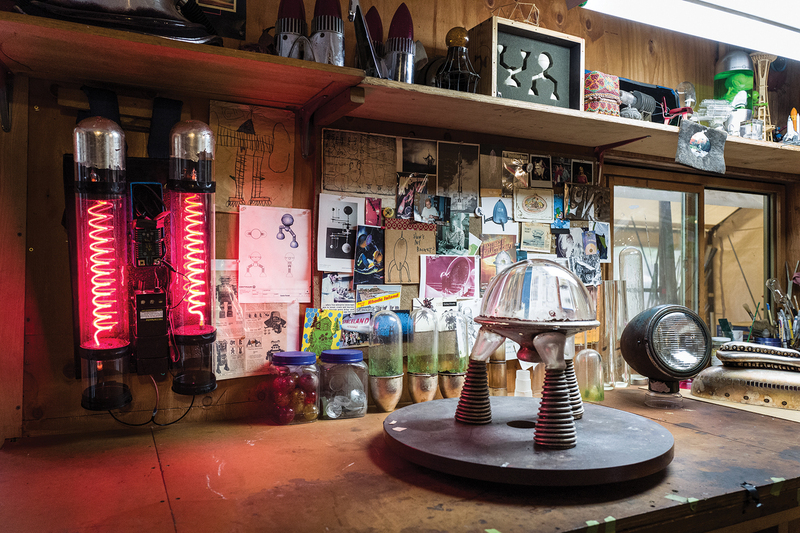 Allen’s studio bench is home to a collection of objects, parts, and images that inspire him. Fuller’s Finder, a work in progress, almost looks alive as it awaits the artist’s hand. Allen visited NASA earlier this year. A direct result was The Flea (2016), his take on a real vehicle in development for the manned mission to Mars and its moons. 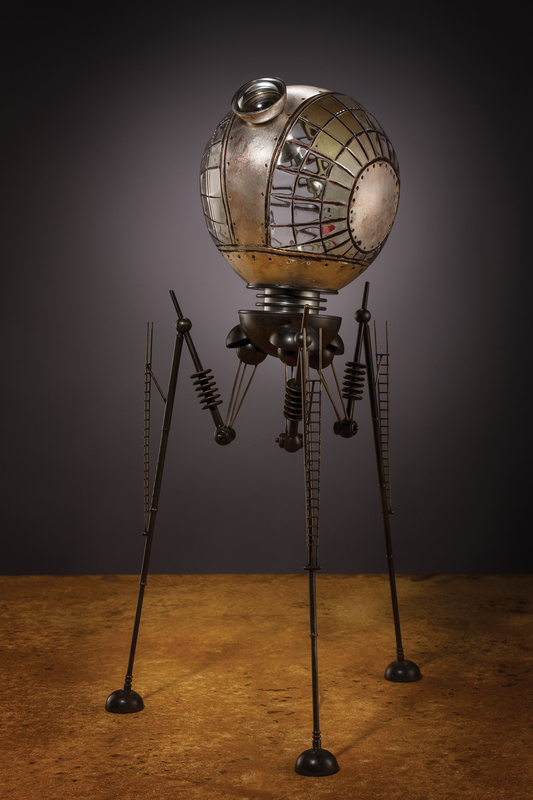 Kepler Optima O (detail) is a kinetic sculpture with mechanisms based on solar system models. When activated, the interior configuration whirls around the chair, which rotates in the opposite direction. 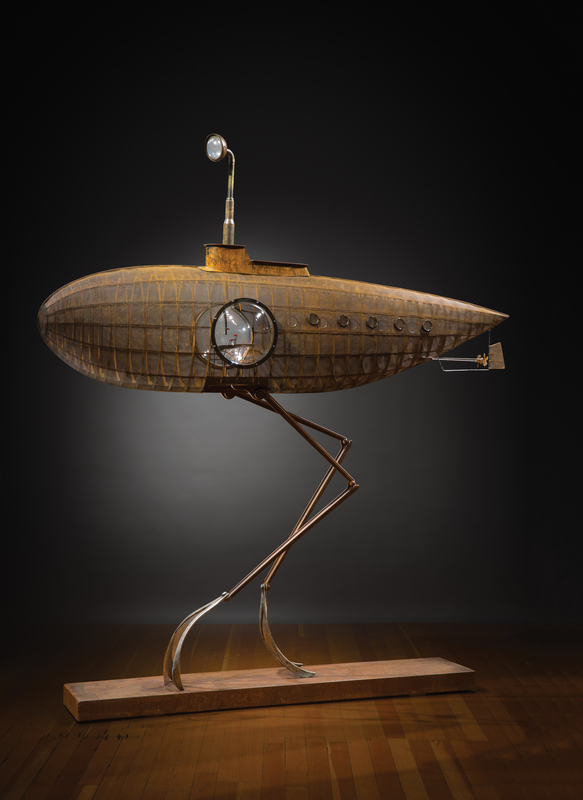 Salish Sojourner (2016) is on view in “Metalmorphosis” through February 5 at Bellevue Arts Museum in Washington. 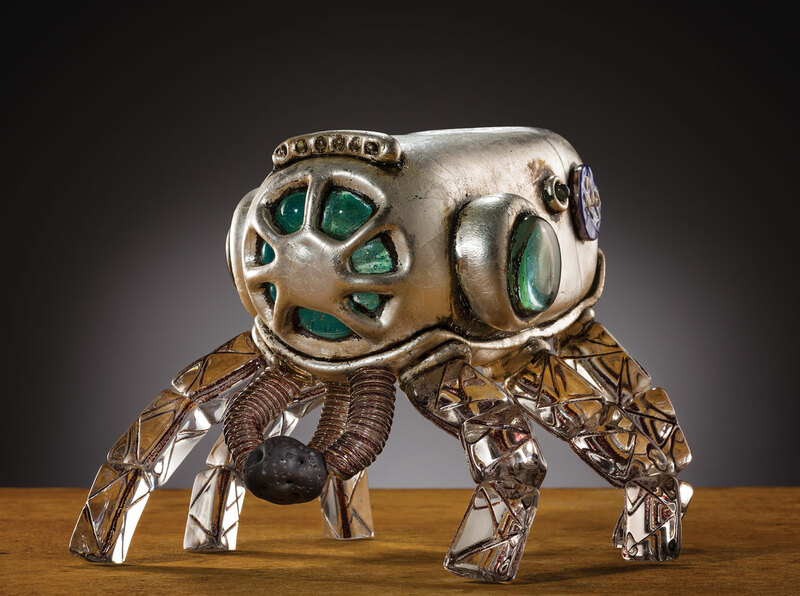 Allen is equally at home among glass and metal artists. 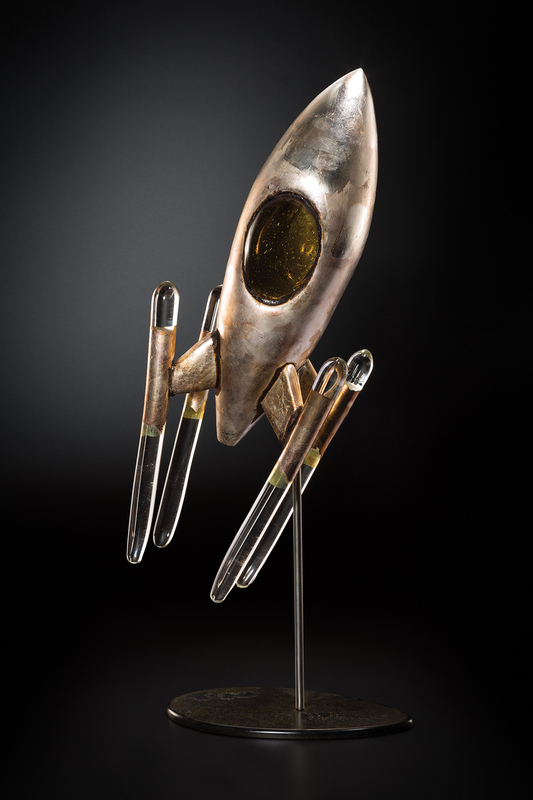 Drifter, 2011, blown glass, silver, steel, 25.5 x 16 x 19 in. 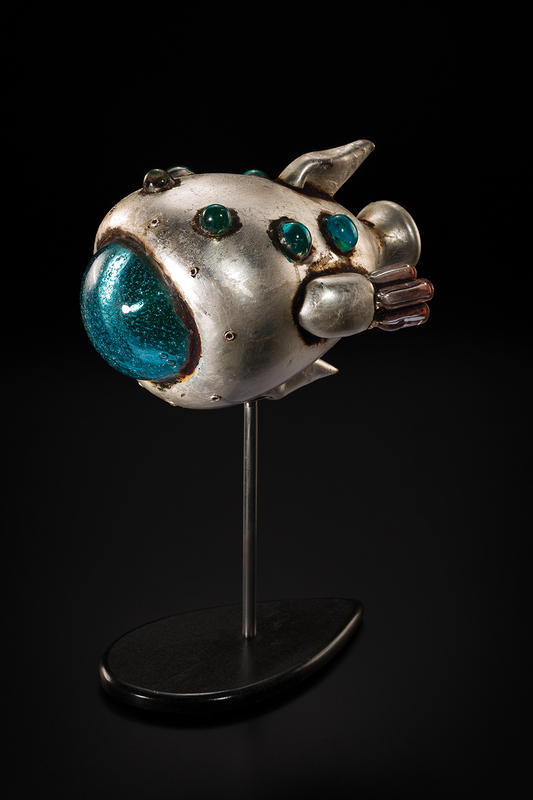 Helio Centauri, Deep-Sky Maelstrom Apparatus, 2014, blown glass, silver, steel, 28 x 31 x 11 in. Cyprus Seven, 2015, blown glass, silver, mixed media, 11.5 x 9 x 6 in. Valenci Four, 2015, blown glass, silver, 28 x 9 x 6 in. 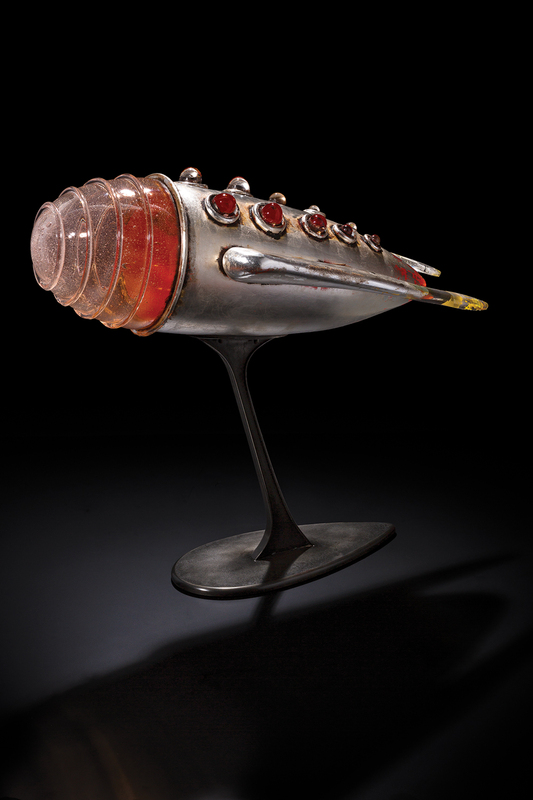 Cognus Ocularium, 2014, blown and cut glass, silver, steel, 23.5 x 12.5 x 13 in. 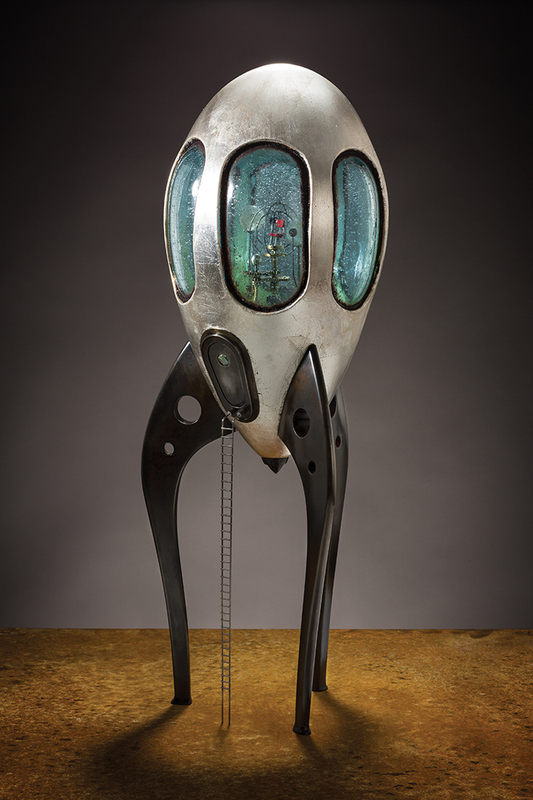 Kepler Optima O, 2014, blown glass, silver, steel, brass, gear motors, 28 x 11 x 11 in.